A few topics came to mind as I reflect on this year’s Blog Action Day topic – Poverty. I had wanted to write a post personal experience and I thought of writing something relevant to this blog and my job – looking at how mobile phones could help with poverty in some emerging markets. (And some day, I might just post on that two topics). But i figured, for now, I should highlight some initiatives/ organisations out there, supporting and fighting to end poverty and the opportunities for each of us to reach out and support/ do our part. 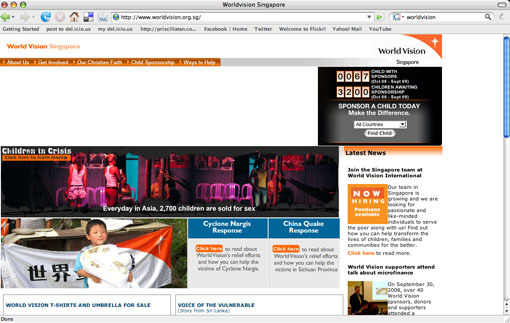 For a start, let’s look at what my own country, Singapore is doing? 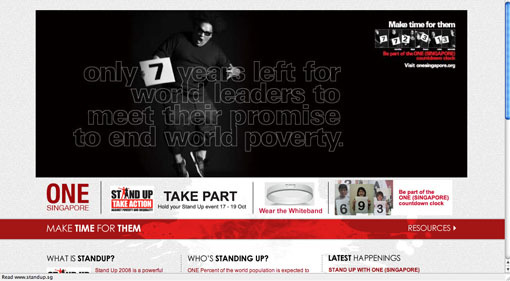 To support the Stand up 2008, a global initiative by the UN Millenium campaign in collaboration with the Global Call to Action Against Poverty, Singaporeans are organising a series of activities to “Stand Up, Take Action” together from 17 – 19 October. Check them out! Thanks to my colleagues (Ray and Gavin) who brought Worldvision to our attention, Jon and I had recently decided to sponsor a child with the help of the organisation. It is a Christian humanitarian organisation dedicated to working with children, families and their communities worldwide to reach their full potential by tacking the cause of poverty and injustice. We are extremely excited and very blessed to be in a position where we can afford to give and bless. I will probably share more once we finalise details. Again, thanks to Jeremy, my colleague who knew of my obsession with books – brought to my attention the Room to Read organisation. They are doing things that are very close to my heart. The organisation partners with local communities throughout developing world to provide quality educational opportunities for children in the countries, striving to break the cycle of poverty, one child at a time. And there are many other initiatives, organisations and resources out there. Mashable.com has put together a good list. 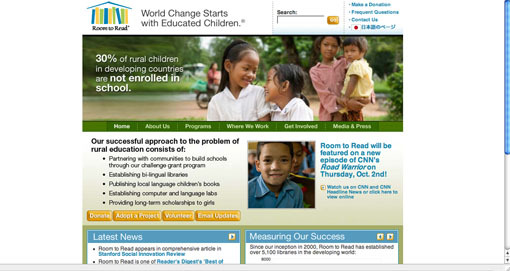 This entry was posted in Technology & Digital, Travel and Events and tagged blog action day, Blogging, poverty, room to read, Social Media, stand up 2008, worldvision by Priscilla Tan. Bookmark the permalink. Nice blog, I love to see this kind of content, keep up the good work. How coincidental, I wrote about Room to Read as well. I got to know of R2R some time ago on the Oprah show. The founder, John Wood was being interviewed by Oprah and I find his journey inspiring. It’s hard to give up a six-figure paycheck to do something like that. I also find it sobering when he also mentioned that after he left his job at Microsoft and founded R2R, there were a few instances when people shunned him at high-society parties. I was thinking, has society really degraded to such a superficial level? Anyway, I hope to do something for R2R next year. Maybe start a book-raising at my office or something. Long time didn’t hear from you. 🙂 I think one of my colleagues is involved in the org. I have very similar thoughts too, about the book collection. It is really inspiring what some of these organisations are doing and it is not easy work. Thanks Eugene for the note. There are alot of more important things in the world that need our attention.